The Club was formed in December 1993 and undertakes voluntary work and fund-raising for needy causes in the Leigh area. 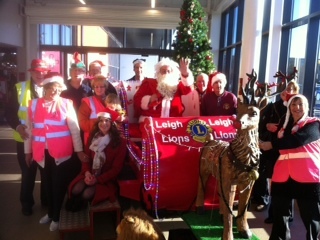 The Lions are fun loving and caring people who meet twice a month at the Leigh Miners Club and they will soon be out and about at the town's supermarkets with their Santas Sleigh. The club is always on the lookout for new members, both men and women, so if you have a few hours to spare and would like to offer your time and skills to those let fortunate than yourself and have fun while you are doing it then Leigh Lions Club is for you. Our motto is "We Serve" and 100% of money raised from the public goes to charitable causes in our local and wider world communities.